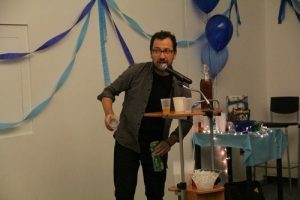 Host Robbie Saenz de Viteri turns a downtown dance studio into an after-work office party complete with wall-to-wall carpeting, karaoke and dollar store decorations. 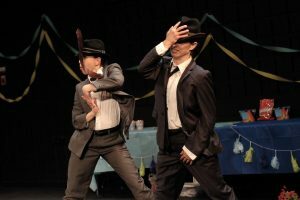 Dressed in a pair of everyday men’s suits, performers Monica Bill Barnes and Anna Bass crash the party playing two totally familiar guys who go to great lengths to win over the crowd. Every desperate attempt reveals how hilariously unsuited they are for these roles that they insist on playing. One hour in length, Happy Hour is suited for audiences 50-400 in size. Built for the proscenium stage, Running As Long As We Can is a comedic, poignant portrait of what it means to be a dancer and the tension involved in the enduring pursuit of a highly physical life. The rigorous and athletic performances of Monica Bill Barnes and Anna Bass are framed with narrative, back story, and play-by-play calling. Robert Saenz de Viteri creates the role of sportscaster, narrating the night as a live sporting event. Running As Long As We Can features a multi-generational ensemble, cast from the local community at each touring venue. The cast is entirely female, ranging from very young to elderly, representing women in various stages of movement—from the early moments of unselfconscious abandon of an eight year old to an elderly person’s determination to continue to carry out a simple physical task such as walking on a treadmill. Founded in 1997, Monica Bill Barnes & Company is a contemporary American dance company that brings dance where it does not belong. We create and produce each work entirely from its own rulebook – dancing to radio interviews on the biggest stages in the world, hosting a weekly show in a crowded office party, or leading a choreographed exercise routine in an art museum. Within each of these new contexts and borrowed environments, we constantly find humor in our awkward, everyday triumphs and failures. Monica Bill Barnes is a choreographer, performer, and the Artistic Director of Monica Bill Barnes & Company. Barnes founded MBB&CO in 1997 with the mission to celebrate individuality, humor, and the innate theatricality of everyday life. Her work has been performed in venues ranging from Upright Citizen’s Brigade to The BAM Opera House, and has been presented in more than 80 cities throughout the US. Current projects include a collaborative show with radio host Ira Glass that combines radio stories and dance, Three Acts, Two Dancers, One Radio Host; a collaboration with author/visual artist Maira Kalman creating a guided Museum Workout; Happy Hour, the world’s only office party turned dance show; and One Night Only, the company’s newest show that will premiere in NYC in fall 2017. Anna Bass (Associate Artistic Director/Performer) has worked with MBB&CO for 15 years, performing all over the world on stages ranging from public fountains and city parks to comedy clubs and Carnegie Hall. She collaborated on all of the company’s current productions, and also served as Assistant Choreographer for productions at The Atlantic Theater, The Public Theater, and Yale Repertory Theater. Anna wears the grey suit in Happy Hour, the bronze dress in The Museum Workout, and tours the country with Monica and Ira Glass in Three Acts, Two Dancers, One Radio Host. Anna is originally from Forest, Virginia, where she studied almost every dance style from classical ballet to country line dancing. She lives in Brooklyn, NY. Robert Saenz de Viteri (Creative Producing Director) began working in theater as an audio script assistant to Anna Deveare Smith. He has created performances and toured productions throughout the world with the Obie Award winning Nature Theater of Oklahoma. He has created, produced, and performed in Happy Hour and The Museum Workout with MBB&CO. Some of his other favorite projects include producing This American Life Episode 528, “The Radio Drama Episode” live on stage at BAM, directing Rachel Bonds’s Michael & Edie, and working in Norway to create The Spiritual Life of Modern America, based on the experiences of foreigners traveling in America today.